Tom Grieve, as he readily admits, has been the Texas Rangers' ultimate utility man. As a member of the charter 1972 club, he went on to spend six years as a part-time player for mostly losing teams. He later was the team's general manager for 10 seasons, never reaching the playoffs. And since 1995 he's been a member of the Rangers' broadcast team, relying on his various partners to do most of the heavy lifting. FSN Southwest's 30-minute In My Own Words: Tom Grieve, airing Sunday, June 8th at 10 p.m. (central), affords the subject a chance to be his usual self-effacting self. Some have dubbed him "Mr. Ranger," and it "makes me feel good that someone would say that," he tells interviewer John Rhadigan. On the other hand, he quickly adds, "I know it's based pretty much on longevity." The special, being repeated throughout June, premieres at a crossroads for Grieve. After the June 8th Rangers game, he'll have surgery for prostate cancer and miss at least two weeks of telecasts. FSN says that the final version of In My Words will incorporate a brief segment in which Grieve, 60, talks about suddenly having to cope with cancer. This otherwise is a breezy outing, beginning with Grieve's recollection of taking batting practice at Randol Mill Park in 50 miles per hour winds. Major League players were on strike at the time, and Grieve initially didn't think much of Arlington in comparison to his previous tenure in the picturesque nation's capitol with the woeful Washington Senators. "All of us are thinking we're not a very good team so we probably don't have the right to complain too much," he tells Rhadigan. "But this doesn't feel like the big leagues." Rhadigan is a bit prone to making statements -- "You have grown up with a baseball family" -- rather than posing questions. And some points of interest are never broached -- such as his favorite Rangers anecdote or what it was like to play for the volatile Billy Martin. Time goes by fast, though, and there's a lot of ground to cover. 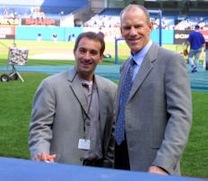 Grieve also generously diverts attention to his first Rangers broadcast partner, the late Mark Holtz, who groomed him to be successful in the booth. "He could make something out of nothing," Grieve says. "And if he ever did have a great game coming down to the end, there was absolutely nobody better that you could be listening to than Mark Holtz." The program includes Holtz's climactic calls of Kenny Rogers' perfect game and Nolan Ryan's last no-hitter, his seventh. A nice selection of early Grieve photos also make the cut. Grieve isn't namby pamby in the broadcast booth, and over time has become more willing to deliver verbal brushbacks. Mostly, though, he's a very nice guy who brims with enthusiasm for the game and is always willing to talk about others' exploits. That comes through again and again in this generally engaging half-hour, minus the usual seven-minute load of commercials. And after all the verbiage, it goes without saying that we wish this man for all Ranger seasons a full and speedy recovery.